Today is the September Equinox, and back home this would be considered the start of Autumn. September makes me think of long shadows, bright but cooler days, and the evenings starting to shorten quite noticeably. Leaves are changing colour, and there’s a melancholic feel in the air. It’s almost the start of another academic year. Not so here in Bangalore… I think we’re coming to the end of the Monsoon. The lack of recognisable seasons is one of the things that still makes me feel a bit lost here, but I guess once I’ve been through the cycles once or twice it will start to make sense. While August and early September were pretty wet, with a sizeable downpour most days, the last week has been mostly dry, the nights have been getting noticeably warmer again, and I’ve had to put the air conditioning on a couple of times. Out on the balcony, my second batch of tomatoes are just coming through with lots of flowers and a few fruit already, plus a surprise melon appeared in a pot with a couple of cuttings that had perished. I don’t remember planting it, but then I’m pretty slack at labelling anything and tend to shove seeds and seedlings into any pot I can find. I must have planted some seeds from a cantaloupe I’d eaten. I don’t have much space for things spreading out horizontally, so I’m trying to train it vertically. I’ve also got coriander, mint and basil out there, as well as various palms, bamboos and stuff. Several bougainvilleas I’ve grown from cuttings, and gardenias too — although they don’t seem interested in flowering yet. This is the trickiest part of gardening here for me… I’ve no idea how plants respond to the seasons in this part of the world. There won’t be any frost, even in December or January, and the daylight will only reduce by about an hour a day at the most. How do they know what to do? I leapt out of bed this morning at 6am, as I often seem to do these days (totally out of character for my previous life). A Coucal was calling loudly right outside my window — an exotic, jungly-type sound — and I could see the sky was blue and it was going to be a warm, sunny morning. Just after dawn is my favourite time here. It’s cool, relatively quiet before the traffic starts, and generally quite peaceful. 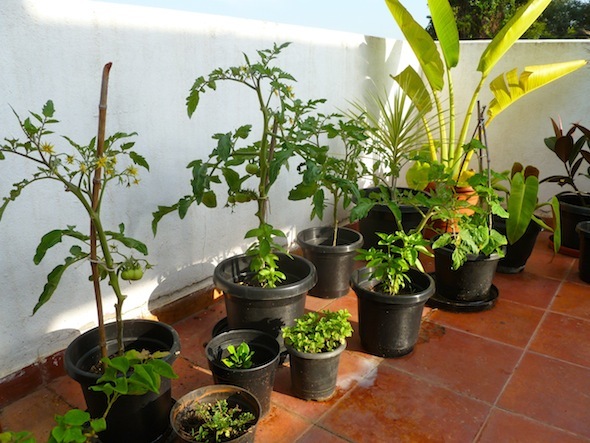 It also gives me time before going to work when I can potter about on the balcony a bit and water some plants, check how everything’s doing and continue my on-going battle against Mealy Bug by spraying vulnerable plants with Neem oil. This morning I also noticed that a large plant-pot full of standing water had lots of mosquitoe larvae floating in it. Pretty glad I spotted that. Twice as big now, and trained up a small pyramid of sticks, but I’m going to have to get some trellis for it or something… any idea where to get this kind of thing in BLR?